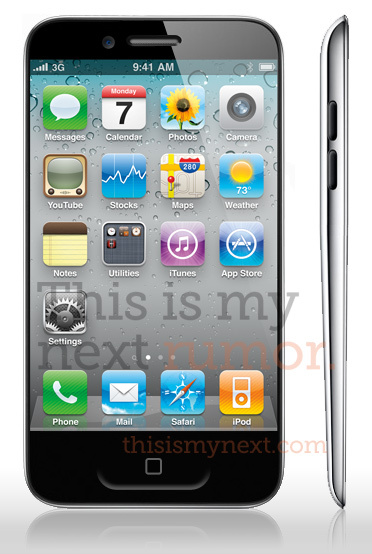 What the iPhone 5 Might Look Like? I Doubt It. While even the probable release date of the much-rumored iPhone 5 still a dark pit of rumor and hearsay (hear: September), details of the actual device are apparently starting to unfold. The infamous Apple rumor mill has spawned a flock of tech-blogs eager to uncover the Next Big Thing, and, on a near daily basis, saucy details are divulged from “anonymous sources” and “industry insiders” with amazing regularity. Self-proclaimed up and comers This is My Next have mocked up an iPhone 5 based on details from one such anonymous industry source, and while they are quick to note to readers that “Yes, folks, that’s our mockup — not a real device”, you can’t help but feel like the post is a shameless traffic-grab – albeit a successful one (the story was picked up by macrumors, gizmodo, AppleInsider, Cult of Mac and IntoMobile among others). The author of the post, former Engadget editor Joshua Topolsky also predicted that the iPad 2 would feature a higher resolution screen and an SD card slot – neither of which eventuated. Based on the the precedent set by every Apple product update ever, it’s safe to say the iPhone 5 will be faster, thinner and lighter, with better reception, a bigger screen and a larger MP camera.